Unique beach home just purchased and totally remodeled. Large wrap around deck with swimming pool directly behind the house. 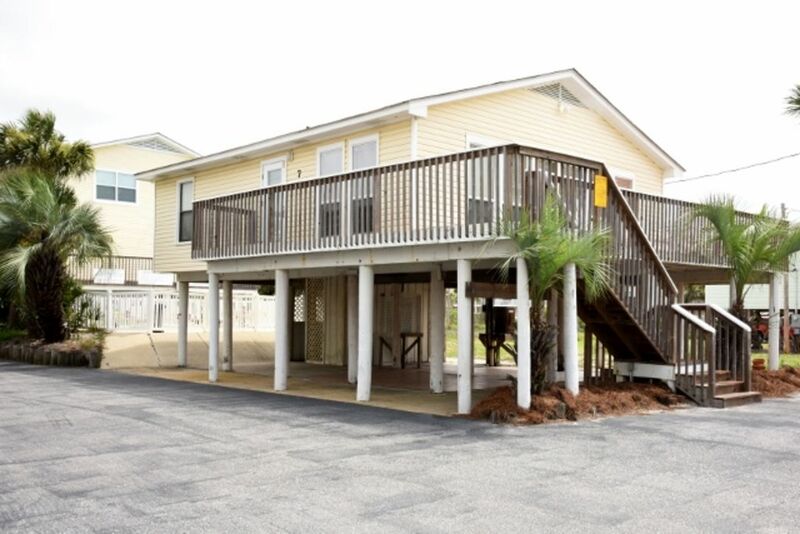 Owned beach access located directly across West Beach Blvd providing a fast and easy walk to the beach. Located just ten blocks from downtown Gulf Shores where you will find all the shops, stores, restaurants, and festivals. Sleeps eight. King bed in master with queen and twin bunks in second bedroom. Equipped with all new bedding and three Vizio flat screen tv's for your viewing pleasure. Computer work station with wifi. Fully equipped kitchen. Book any 2016 stay at the 2015 rates currently posted and save as rates will increase after January 1st, 2016. Just bring the groceries, a smile, and have a great stay at Sea & Sun #7! I first found Gulf Shores in the mid '80's and became an owner shortly thereafter. I look forward to the time I can get here and enjoy the beach and ride the bike paths. I come in the spring and fall every year and the weather is spectacular. I own a condominium and love coming to the beach, however, I wanted something along the beach area where it's less crowded and offers more privacy. I had been looking for a beach cottage for the last few years that had the features and amenities and location I was looking for including a pool, easy access to the beach, and close to all the restaurants and activities. When I saw this property I knew I had found what I had been looking for. Beautiful white sand beaches directly across the street from this home. Easy owned beach access to the beach right in front of property. The house has its own but there is also laundry facilities on site. Free parking directly in front, 3 spots. Cable in all 3 rooms. Several golf courses located within a few miles of the property. Greqt place to stay at. It was clean and more than we expected. Alot stuff within walking distance. Party store 4 downs down. We would rent this again in a heart beat. Wonderful location, short walk to beach, nice clean cottage, and lots of fun things to do. Would recommend this to anyone wanting a cool place to relax. The house was in a great location close to the beach. We loved going to the beach every day. The house was all the comforts of home and just across the street from the amazing white sandy beach. We could not have ask for better! We had an amazing time and are already thinking about next year. Girls long weekend...... so mellow laid back and relaxing with the pool and the gulf house had every thing you could need..
My family and I really enjoyed our stay. My granddaughter and daughter had a lot of fun in the pool. In addition to the spectacular beaches the area offers excellent in-shore and off-shore fishing, several great golf courses, two large amusement parks, excellent seafood restaurants, and much more. The Gulf State Park has several bike paths that go for miles and you can rent kayak's that will take you through secluded and protected wetland areas. : If Guest wishes to cancel his/her reservation, their payment will be refunded as follows: ●	100% if cancelled more than 60 days prior to the Check-in Date ●	50% if cancelled more than 30 days prior to the Check-in Date ●	No refunds for cancellation less than 30 days prior to the Check-in Date. ●	No refunds will be given after the Guest arrives.